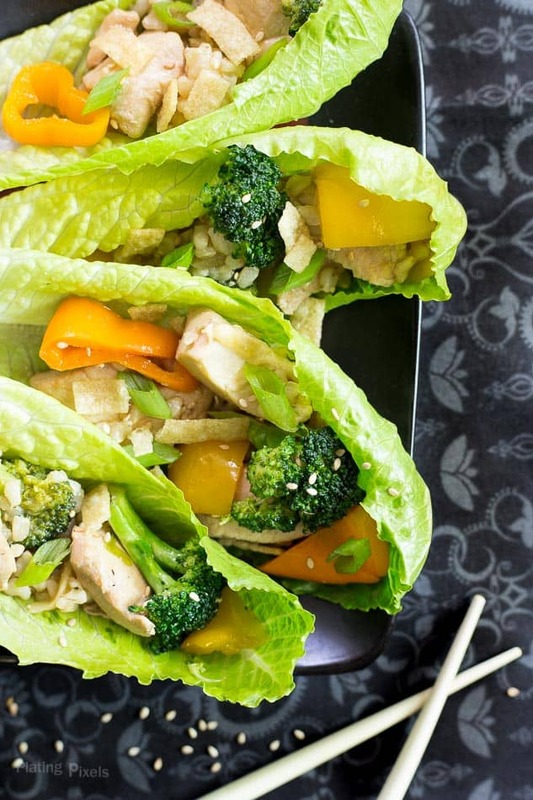 Chicken Stir Fry Lettuce Wraps for a quick and healthy weeknight meal. Loaded with veggies, lean protein and complex carbs, plus it’s gluten-free. So easy and ready in a flash! Within this recipe post you’ll make a quick and healthy weeknight meal that’s outside of your usual menu list. Plus you’ll learn about stir-frying and why it’s ideal for this recipe. You come home after a busy day of work and errands but don’t want to eat out or order takeout. So what to do you make? 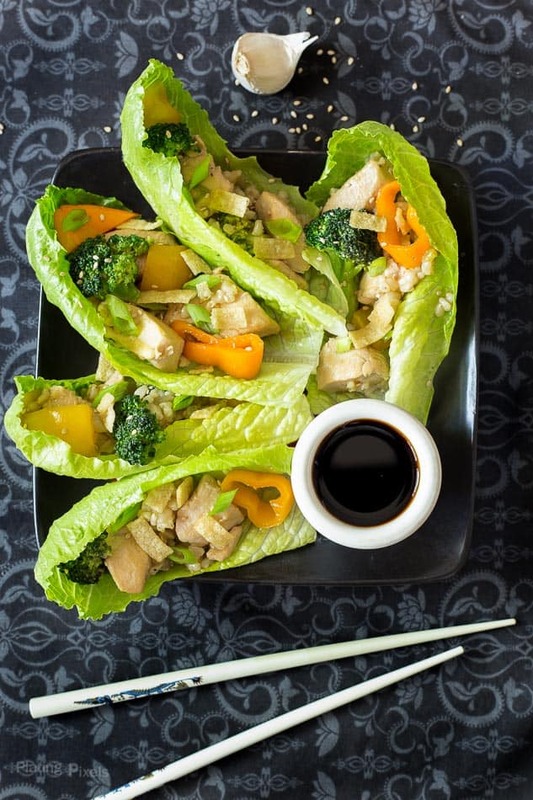 How about a quick and flavorful meal like Chicken Stir Fry Lettuce Wraps. I never quite understood the term weeknight meals. I’ve touted plenty of my recipes as ideal weeknight meals, but have been trying to decide what that phrase really means. To me it’s any meal that’s filling (ideally healthy) and comes together fast and with minimal effort. Ok maybe I just answered the question myself. But weeknight meals should be as important as any other meal. The majority of you week is filled with weeknights, so have fun with it and enjoy creative meals often. 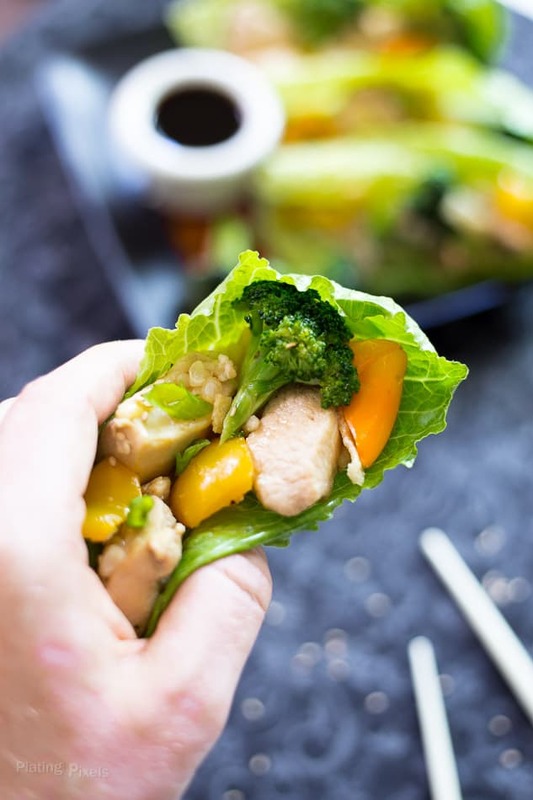 Chicken Stir Fry Lettuce Wraps takes a classic stir-fry and gives it a healthy twist. You use less rice and replace with vitamin and mineral-rich lettuce. It’s an easy way to get in extra veggies. Plus this stir fry is loaded with crisp and tender broccoli florets, bell pepper and water chestnuts. Combined with chicken and rice; it’s full of lean protein and complex carbs, and is low-fat. Stir fry is a quick and fun way to enjoy your meats and veggies. It involves cooking food over a very high heat for a short amount of time. It keeps vegetable crisp without being soggy, and meats are moist and browned, adding extra flavor. High heat sears the outside, keeping liquid and flavors in. It’s best to cook small pieces for more surface area and quicker cooking. This is why ingredients are chopped ahead of time. Be sure to use oils like light olive oil, peanut oil or safflower with high smoke points to prevent smoking. 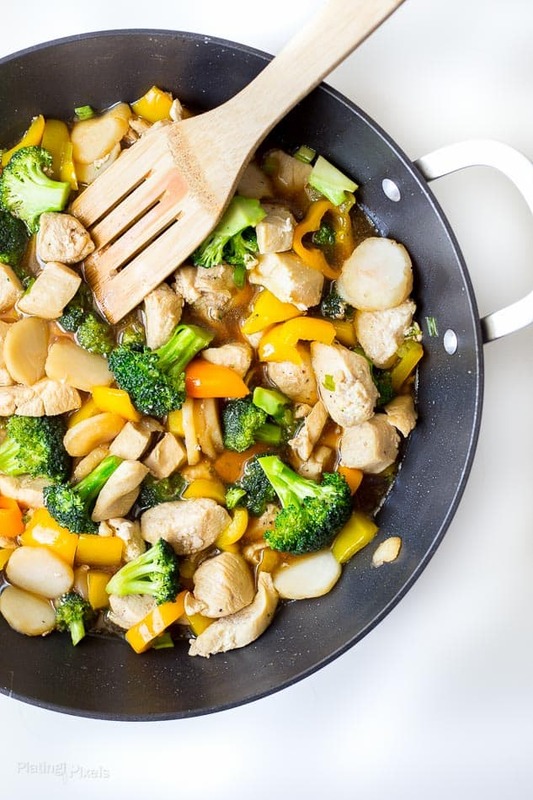 Learn more about stir frying here from CookingLight. Flavor profiles: Savory, salty and umami; classic stir fry flavors. Texture: Chewy, tender chicken and soft rice paired with crisp, fresh veggies. Dietary options/substitutions: For even lighter/less calories omit rice and add more veggies. Chicken Lettuce Wraps for quick and healthy weeknight meal. Meanwhile: Heat 1-tablespoon peanut oil in a wok or large pan to high heat. Add chicken and cook 5-7 minutes, stirring often, until cooked through and opaque. Remove from pan. Heat remaining peanut oil to high heat. Add broccoli and bell pepper and stir fry 5 minutes, or until just tender. Reduce heat to medium and stir in water chestnuts, soy sauce, sesame oil, cooked chicken and rice. Cook a few minutes to heat through. Spoon desired amount of stir fry mixture onto lettuce leaves and garnish with wonton strips, sesame seeds and green onions. I think these are the prettiest lettuce wraps I’ve ever seen — and I’m a big fan of Albertsons! Such beautiful colors and photos! That looks so refreshing! I love lettuce wraps. the cold crunch contrasting the hot filling! ah, perfect! I love a good lettuce wrap recipes and these look incredibly refreshing for summer lunches! I haven’t had stir fry in so long. I’m gonna have to give these a try with tofu really soon! I love anything wrapped in lettuce! Will definitely be trying this one out soon! Nice chopsticks by the way!